Xion and a moogle I don't know what's cuter? How else will they hide their drugs? Trying to reach the Second Star to the Right. Never thought sea salt ice cream had wrappers. Man, I don't really have this game because i don't have a DS. But the manga looks great by the way. 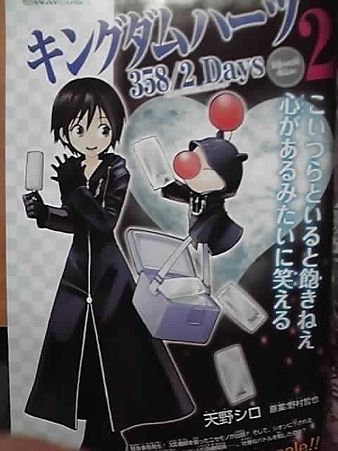 And it's also cute of Xion and the moogle too.! That moogle is too cute. The Moogle selling cocaine-sticks is only made more hilarious by the lines under Xion's eyes. Interesting how KH looks blue as in BBS instead of Yellow. SO CUTE. Xion looks adorable, and so does moogle! Woot woot!